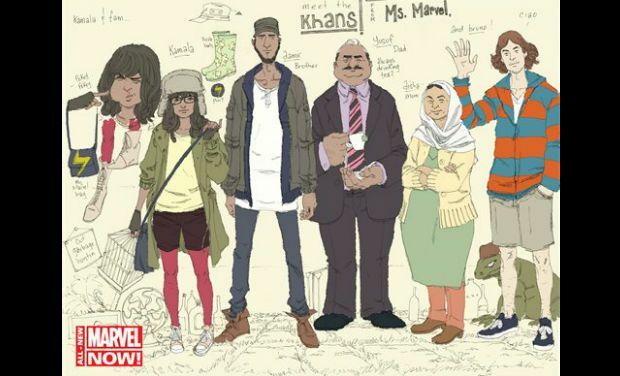 Marvel's newest superhero: A Muslim Pakistani-American teenager named Kamala Khan. Marvel Comics&apos; newest superhero is more than just a symbol of diversity and a deviation from the white, male norm that Spiderman, Wolverine, Captain America, and countless other comic book heroes occupy. Kamala Khan, a teenage Muslim girl living in Jersey City, also looks and sounds like a real person, albeit with extraordinary powers. In a universe where most female superheroes are impossibly stacked and Barbie doll-proportioned (to draw ogling male eyes) Khan is a refreshing change of pace. She is pretty, yes, but rock-hard body "hotness" is not what defines her. Writer G. Willow Wilson, a convert to Islam, says Khan was created as a true-to-life person teenagers could relate to. "It&apos;s for all the geek girls out there, and everybody else who&apos;s ever looked at life on the fringe," Wilson said in a statement. Khan, who will make her debut in January, is radically different from most of Marvel&apos;s most popular female superheroes, but also appealingly meta for a fanbase already attached to legacy characters. While she lives with conservative Pakistani parents, she fits the mold of an angsty teenager and an outsider in school. She also is an avid reader of Marvel comic books. So when she discovers her superhuman power as a polymorph — being able to lengthen her arms and legs and change shape — she takes on the name Ms. Marvel, a title which previously belonged to the blonde-haired, blue-eyed Carol Danvers. Now, Khan&apos;s story will be the one to inspire a new generation of girls and boys. Series editor Sana Amanat, who also worked on Ultimate Spiderman and Ultimate X-Men comic books for Marvel, told Reuters that a reflection of the Muslim-American experience through the eyes of a teenage girl creates a font of endless possibilities. "We are always trying to upend expectations to an extent, but our point is to always reflect the world outside our window, and we are looking through a lot more windows right now," she said. In fact, the idea for this new kind of superhero came from a conversation that Amanat had with her senior editor, Steve Wacker, about her own experiences growing up as a Muslim-American. "He was interested in the dilemma I faced as a young girl and the next day he came in and said, &apos;Wouldn&apos;t it be great to have a superhero that was for all the little girls that grew up just like you, and who are growing up just like you are today, and to create a character they can be inspired by?&apos;" said Amanat. Of course, girls have been inspired by female superheroes from the moment Wonder Woman first appeared in All Star Comics #8 in 1941. But more than 70 years later, the endless parade of unbelievably bodacious babes in skin-tight bodysuits has begun to wear thin. Female comic book fans need more than a strong, independent woman with superpowers and a slamming body to stay interested. We need diversity, in every sense of the word: racially, culturally, intellectually, and physically. In my opinion, this is in part why so many comic book films and TV shows helmed by female superheroes (Elektra, Catwoman, and the Wonder Woman series that never made it to air) have fallen flat in recent years. The average woman or adolsecent girl has to fall in love with these characters too. If all she sees is plastic, how can she relate? I&apos;m excited to see all of the new stories that the creators of Kamala Khan will bring to life, but I also long for more. When will we see a mainstream superhero who is gender-queer or transgender? Why do the female characters continue to be drawn to serve the male gaze, with their supermodel sexiness and perfectly-chiseled abs? Isn&apos;t it about time we had a full-bodied female superhero, or at the very least, more fully-clothed ones? Still, the good news is that times are changing, and Kamala Khan has punched a hole through the glass ceiling with a resounding smash. Leah Pickett writes about popular culture for WBEZ. Follow her on Twitter at @leahkpickett.